Bomberman Blast is a blast! I had very high anticipations for this new Bomberman game as it features eight player mayhem not only online but locally as well! That’s one crowded couch! I knew of this beforehand and even wrote a suggestion for control setups for the developer, but sadly none of my ideas were implemented, not even using the nuchuk instead of the GameCube controller, sad face. I tried to write some comprehensible summary of the game, but here are my immediate feelings about the game instead. I was skeptical to a 3D-bomberman, due to the perspective distortion, but it didn’t take long for me to love it anyway! The graphics are smooth and nice, the levels look gorgeous and the sounds are a treat. I guess after playing Bomberman ’93 for several months that’s what anyone would think. I recognized a bunch of powerups, like the throw glove, punch glove, kick boot, roller skates, extra bomb, flame, golden flame, triple bomb, water bomb, land mine, power bomb, spiky bomb and of course the epic virus skull! New powerups (for me) were the dangerous bomb, and the powerDOWNs, the blue flame, minus bomb and minus boot. In addition to powerups you can pick up items which you use by either shaking your Wii remote or alternately tapping your shoulder buttons on your GameCube controller. These items are the rocket pack, shield and bomb disguise. They seem overpowered at first, but the rocket pack and shield takes a bit of skill and brains to use. If someone managed to use them successfully, it’s a laugh! I have yet to play eight players. We did play six players, and it was a (huhu) blast. I have ordered extension cables for the GameCube controllers as the WaveBird controller is just about impossible to get your hands on now, cheaply anyway. Oh, and I think the starting blast range is shorter than before. Probably as that enables smaller starting areas, which means room for more players! It has caused me to bomb a spot three or four times in a row without hitting anything though :P but that was way past midnight too. All in all, if you are like me, and love local multiplayer games (well, it has online too), these will be 1000 Wii points very well spent! 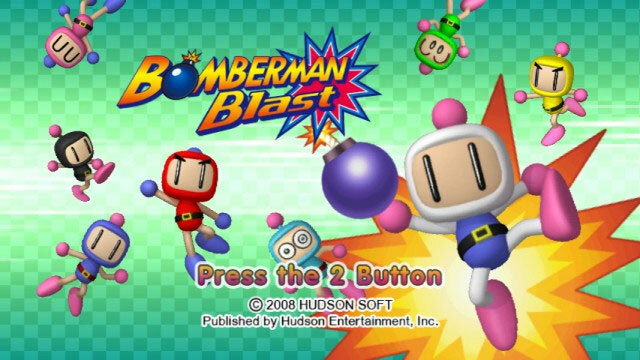 And as an owner of Bomberman ’93 I have to say that getting Bomberman Blast as well is definitely not a waste. It is very much worth it, especially if you have many merry friends! Buy it! You will not regret it! This entry was posted in Gaming and tagged Casual Review, Gaming, Wii, WiiWare. Bookmark the permalink.